So you’re planning on getting married this summer, and you just have to find a perfect house to call your own before that magical day. Or very soon thereafter. There’s no possible way you could continue to live in an apartment and rent once you’re married! That just won’t do. Married people are supposed to be homeowners, right? Not so fast. It’s a big financial decision that shouldn’t necessarily take place while you’ve got a lot of other major life changing events in the works. Why do newlyweds and newlyweds-to-be have this must-own mentality? Is it the seriousness of marriage, or the need for a solid foundation to begin raising a family? While I get the latter part to some extent, one shouldn’t buy a home simply because of a recent or upcoming wedding. You should buy a home when you have given it a lot of thought, done your due diligence, and are financially secure to go through with the purchase. Married or not, one must take the time to determine if homeownership is for them. Guess what? It’s not for everyone. We don’t all want the responsibility of owning a home or condo. It can be a lot of work, hard on the finances, and super stressful. There’s also the question of home prices, which are pretty sky-high at the moment. One should always take the time to consider the current state of the real estate market too. Obviously, there will be people marrying at the height of the market and at market lows. That latter group might have a great reason to buy a home, whereas the former group could make an ill-timed decision and add a lot of uncertainty to a new marriage. All I see these days are new couples rushing into home purchases because they’re engaged or newly married. It appears to be the next logical step in life, but forcing the issue just because everyone else is doing it isn’t necessarily the right decision. Sure, kids are often not too far out once you tie the knot, assuming you want them, but that doesn’t mean you just take another plunge. Give it some serious thought, just as you did your wedding (hopefully). Like marriage, it’s a major commitment. For me, this seems like a huge layer of stress to pile on top of an already stressful period. Buying a home is no trivial matter, and could lead to arguing and fighting, which is no way to start a marriage. Additionally, you’ll probably have lots of expenses related to the wedding and subsequent honeymoon, so it might be tough to come up with the minimum down payment on the home purchase. This could put you in a bad position, or force you to attempt to buy a home with nothing down. Sure, it could be an option to buy with little set aside in the bank, but at what price? Expect a higher mortgage rate, higher monthly payment, and perhaps a less competitive offer relative to others willing to put more down. A wise couple should take the time to organize their finances, check and fix their credit if necessary, and do a lot of debt-to-income and valuation homework before even thinking about buying a home. It doesn’t make sense to rush into the purchase of a home simply because your relationship status changed. But it is perfectly sensible (and smart) to begin the conversation as early as possible, just as you would other important decisions like having kids. This is especially true as you get to know your significant other’s saving and spending habits, and perhaps their not-so-good credit history. It’s not uncommon for one individual to weigh down the other in that department, which could jeopardize the entire mortgage approval. 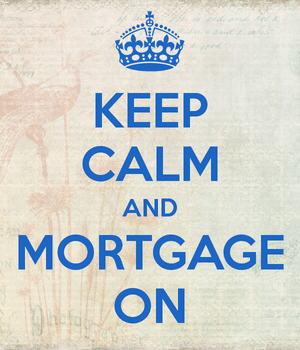 Speaking of, start with a mortgage pre-approval before you begin scouring listings and picking out furniture. You certainly shouldn’t start your marriage off with a rash decision just because it’s the “normal” way of doing things, or because other couples or family members pressure you to buy a home. Take your time and do it right, whether you’re planning to get married, newly married, or even if marriage isn’t even on the radar. What About Buying a Home Before Marriage? A trend that has emerged in recent years, especially among the Millennial cohort, has been buying a home before marriage. You can call it progressive or unconventional, or perhaps smart if two people see a good buying opportunity they don’t want to miss. Some of the advantages to purchasing a home before marriage include having more money for a down payment (since it hasn’t been wasted on a big wedding ceremony). Or simply buying a home solely because you want to, not because you’re married and feel pressure to do so. On the other side of the coin, owning a home together before marriage could pressure you to actually get married, even if cracks start to develop in the relationship. You may feel that you have no choice since you already own a major asset together. Some may also have personal beliefs that dictate the order of things, which don’t allow a home purchase before marriage. There are also legal and title issues to consider when two unmarried individuals jointly own real estate or any other asset. Ultimately, real estate and marriage are very separate things that don’t necessarily need to go hand-in-hand. Try to look at the big picture. How will the home purchase fit into the larger plan? Is it better to buy now or later and why? One plus to a post-wedding home purchase is the chance you might get some money as a gift, which could be helpful to cover the down payment and closing costs. You may just want to let the dust settle before you hire the moving van. Should Married Couples Live with a Roommate? An emerging trend lately has been taking on roommates or boarders to help pay the mortgage bill each month. It makes a lot of sense if you’ve got spare bedrooms and don’t mind having friends or family members live with you. Amazingly, this even happens with married couples (I know of at least two firsthand), though I’ve also heard of the arrangement ending fairly quickly, especially once kids enter the picture. 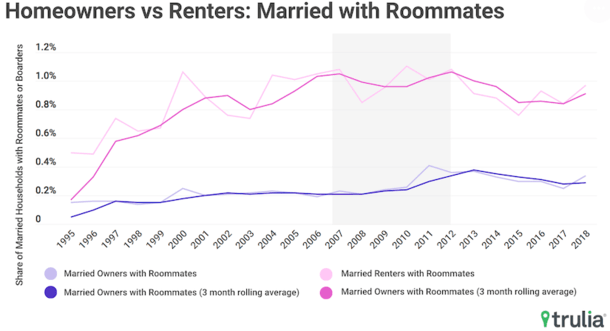 New data parsed by Trulia found that the share of married couples with roommates hit its high in 2012, around the time the housing market was bottoming. It wasn’t far off in 2007 either, when home prices were peaking. They also found that more expensive housing markets (many on the West Coast) tend to have a higher share of married couples with roommates. This could be attributed to affordability issues all around, whether it’s an existing homeowner hanging onto their home by supplementing income from another individual, or a former homeowner or renter being forced to become a boarder during tough times. As of 2018, just 3.28% of all U.S. households had a roommate/boarder. It doesn’t sound like much, but it still accounts for some 4.2 million households nationwide. Among married couples, the rate was a much smaller 0.46%, representing about 280,000 households. While perhaps not for the faint of heart, it could make housing payments more affordable, especially as home prices hit new all-time highs in the more expensive markets nationwide. Read more: When should you start looking for a home?